This product is a 30 degree wedge pillow. Poly/Cotton quilted cover zips off for easy cleaning and is filled with a plant based foam wedge. Measures 20"w 10"h 19"l.
Place your favorite pillows on top of the wedge for a restful nights sleep. Also features the ideal 30 degree angle with soft covering -- wonderful for getting rest with head or chest congestion. Also a highly recommended angle for post-surgical procedures. Excellent to naturally relieve Acid Reflux in adults and children. Used in hospitals across the USA and Canada! Get Relief - Use the AR Pillow. 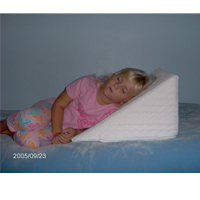 Click the button below to add the Child/Adult AR Pillow- 30 degree Wedge Pillow to relieve heartburn and reflux to your wish list.